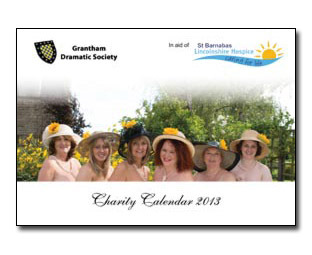 Our beautiful charity calendar in aid of St Barnabas Hospice is on sale now! Buy your copy for just £6 from one of our outlets or, for today only (Saturday 27th October), from our stall at Grantham market. Find out more about the calendar and where to buy from our calendar page. You can also order online and we'll post your copy to you. Tickets for Calendar Girls are selling fast, with around 60% already sold. Don't miss your chance to see Grantham's own Calendar Girls - book your tickets today. Just to whet your appetite, here's a sneak preview of the calendar (right). All the proceeds from the calendar will go directly to St Barnabas Hospice in Grantham to help local people with life-limiting illnesses. For bulk orders or to help us sell the calendars, please contact us.